My friend Mike Goodwin is bubbling: having been involved in building her some years ago, he now crews on board, and this weekend she set a course new record of 11 hours, one minute and 41 seconds in the The Great Chesapeake Bay Schooner Race! ‘We broke our old record and the race record by 17 minutes and 12 seconds,’ he says. ‘What a night it was: we were pushing well above 13 knots at times! Bubble all you like fella! Here’s another video for Facebookers. I must say we had a fabulous day – I thoroughly recommend a trip on one of these boats. I’m also mightily impressed by the gear, which is effective and often ingenious in its working and in its simplicity, and by the barge sailors of the past, who managed these boats with a crew of just two. Those folks were clearly very tough, and more than a bit clever with it. The event was the Blackwater Match – an annual race for barges and smacks, so I’ll post a further collection of boats and the Blackwater itself tomorrow. 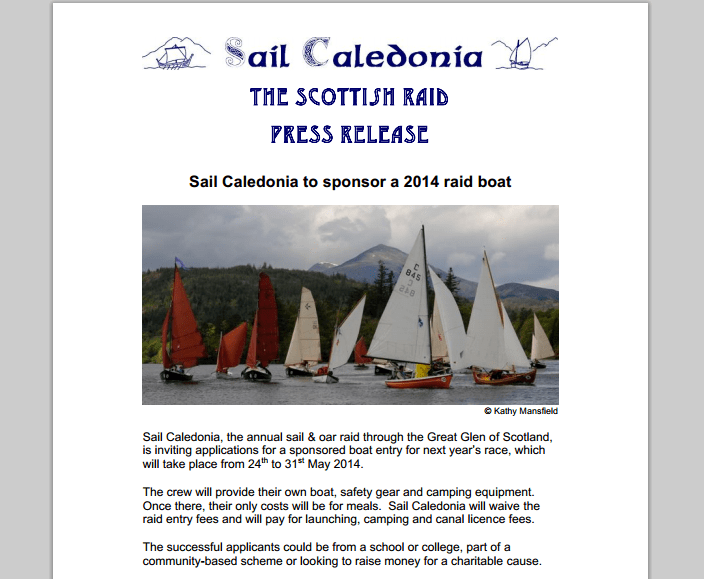 Could your boat be sponsored in the Sail Caledonia Raid? The organisers of Sail Caledonia the annual sail & oar raid through the Great Glen of Scotland are inviting applications for a sponsored boat entry for next year’s race. The race runs from the 24th to the 31st May 2014. The successful applicants could be from a school or college, part of a community-based scheme or looking to raise money for a charitable cause. Applicants must provide their own boat, safety gear and camping equipment, but the only other cost will be for meals. Sail Caledonia will waive the sponsored boat’s entry fees, and will pay for launching, camping and canal licence fees. Applications should be sent to info@sailcaledonia.org by no later than 31st January 2014. The race committee will decide the winning application shortly afterwards. Author Gavin AtkinPosted on October 16, 2013 Categories Boating, boats, ships and the sea, Events, Locations, Sailing boat, Sailing dinghy, Small boatsTags Great Glen, race, Sail Caledonia, scotlandLeave a comment on Could your boat be sponsored in the Sail Caledonia Raid?